Privately set within a large corner plot in a mature, quiet and affluent area of Sea Caves, this impressive 3 bedroom single storey detached Cyprus Holiday Villa has been designed, furnished and landscaped to the highest standards and offers a real taste of traditional Cypriot village life. The villa is located in an elevated position within a district of banana plantations and moorlands with both Coral Bay and Peyia Village close at hand. 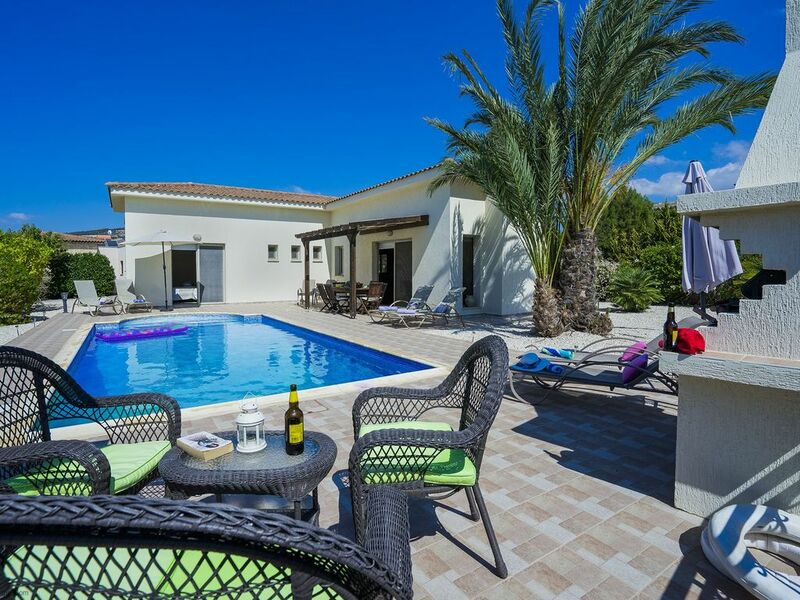 Outside, as well as covered car port and driveway, the villa has an extremely generous landscaped garden featuring a 8m x 4m private pool with roman steps and ample room for sun loungers (6 supplied). A large wooden pergola with woven fabric for extra shade and large table and chairs to seat 6 comfortably and adjacent stone built BBQ provides the ideal place for relaxing in the shade, taking in the views, alfresco dining and socialising with your party. The villa enjoys all modern comforts as well as beneficial extras such as Private swimming pool, Covered Pergola with large dining table (to seat 6), Stone built BBQ, 3 double sized bedrooms, En-Suite with shower, a family bathroom, fully equipped kitchen with dishwasher, breakfasting area with table and chairs, child friendly items such as travel cots and highchair, water purifier and much more. All this added to the Cyprus sunshine, the views across to the Med and the outdoor seating/lounging areas and you are in for a great holiday at The Winning Post Villa. On entering the villa itself, you immediately sense the modern clean lines and smart design features. The lounge has a Silver TV with Premium Channel IPTV and DVD player, and is accompanied by a comfortable wicker style sofa and matching chair. The breakfasting area has 4 high backed chairs with round table to seat 4. The kitchen is well equipped with fitted units , granite work surfaces and tiled splashbacks. Major appliances include a large fridge/freezer, dishwasher, washing machine, oven hob and hood and microwave. As the villa is all on one level (great for elderly or infirm), access to each of the 3 bedrooms can be gained from adjacent hallway. The third bedroom is a twin with 2 large single sized beds and fitted wardrobes. The second bedroom hosts and king-sized bed and fitted wardrobes. The Master Bedroom with patio doors, has a prime position overlooking the private pool and benefits not only from the fitted wardrobes but a lovely en-suite shower room with an enclosed shower as its centrepiece. A handrail has been fitted to the inside of the cubicle to assist those with mobility issues. A family bathroom with bath and shower over completed the internal section of the villa. ''We would like to thank you for a wonderful, relaxing holiday. We stayed at the Winning Post which we found to be home from home. The villa had everything we needed for a relaxing holiday. The cleanliness of the villa both inside and out is exceptional. The grounds and inside the villa well maintained. Only improvement would be a light outside in the car port. The villa is located in a very quiet development with sea views. You need a car to visit Populated areas of Coral Bay and Paphos but for us the location perfect. We visited at the end of October and the two restaurants within walking distance closed early so if we wanted to eat out we had to travel. Would highly recommend Doumo Restaurant off the Tomb of the Kings road, Martellis in the same area. Tea for Two for lunches. Certainly would not recommend Othellos in Coral Bay. Local supermarket Phillipos excellent for all groceries and fresh meat, fish and bread. Reasonably priced. The booking with rent-paphos-villas/letsrentonline is very efficient, communication, information and directions really good. We had a couple of small problems whilst on holiday and these were resolved very quickly. Hannah lovely and mid week linen change was in fact a full clean which was a pleasant surprise. Situated in a very peaceful location, lovely pool. The Winning Post is lovely. Exactly as described, with our requests for a travel cot sorted without any problem at all. We were really pleased with it, and it made our stay perfect. We will be looking to return to the Winning Post without a doubt. Quiet, calm and secluded location. A little out of the way, and most restaurants and shops are too far to walk (taxi's readily available, or a hire car if preferred). Cyprus is the perfect holiday destination, with great weather, beautiful scenery, incredibly friendly people and good food and drink. Coral Bay is lovely, with some great restaurants, shops and plenty of tourist attractions available to book from there. Excellent agent service, all emails were answered quickly, and the service went above and beyond what we have received from other holiday letting agents in the past. Very satisfied with Hannah the local manager who went above and beyond to ensure we were comfortable and were able to check out slightly later, to avoid spending too much time in the airport with our 3 month old baby. Certainly, with a young family this villa is the perfect holiday. This prime positioned holiday Villa is within an affluent area known as 'Sea Caves' and Akamas Peninsular, a protected area of outstanding natural beauty, yet still close to Coral Bay (3km) and Peyia Village (4km) with their traditional bars and restaurants. The property is but a 10-15 minute walk to a few of the best known local tavernas in the area which provide good food, hospitality and views within a peaceful and relaxing setting, next to some of the areas many impressive banana plantations. The Sea Caves area , like much of Paphos, was once rural and barren land but over recent years the Sea Caves area has changed dramatically. Now the Sea Caves area is one of the finest residential areas in Cyprus, offering some of the most exclusive villas in the island. This is not surprising when you consider its breathtaking rugged Cypriot coastline and small sandy coves with crystal clear Mediterranean waters. Sunsets in the region are simply magical. Golf: 4 Golf courses are within half an hours drive.